The Square is a signature multi cuisine restaurant with a restful ambiance and elegant chic interiors. 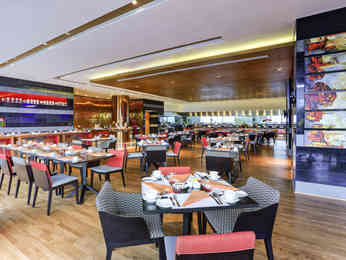 The restaurant offers an opportunity for a leisure breakfast, lunch or dinner buffet with three live counters offering Indian, Oriental and Continental dishes to pamper the palate. Gleaming with natural sunlight and exuberance, the restaurant is striking and graceful. The Square is an ideal venue for spending time with colleagues or for an evening get- together with friends. The place is spacious and fairly plush accommodating more than 100 guests. The chic style interiors of The Square boldly capture the present social texture drawing reference from the European fine dining culture. The lunch and dinner buffet offers fantastic variety and are a treat for all food enthusiasts. The restaurant serves famous world cuisine and brings together an extensive range of International and Indian dishes. 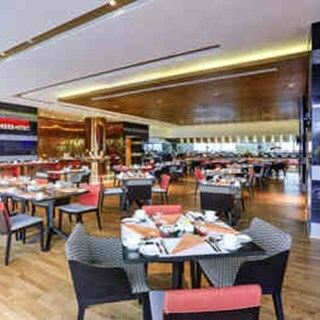 A- la-carte options of international favourites and local cuisines are also available as part of the all-day dining menu. A must try is the special Nahari Ghost Biryani & our fresh Oven Baked Thin Crust Pizzas which is available at the counter. The Square has an outdoor seating (Alfresco) with the swimming pool and a picturesque view of the lawns as the backdrop. It also has a dedicated location for kids where parents can leave their children at ease. Sunday Brunch gives room to unwind with family & friends amidst the lush landscapes, entertainment and fabulous food. The Sunday Brunch promises to complete your Sunday outing with soothing live music, excellent wine selection and great food options. One can spend a relaxed and pampered holiday with attentive staffs to create a memorable experience. The most exciting part of the restaurant is the Thursday & Saturday Night Grills with live counters and lovely music to entertain the guests. On the whole, The Square is a destination on its own that you sure would not want to miss! I am surprised to see the bills of yours. You know you guys charged Rs.190 for 1 litre Aquafina water bottle. fro 4 bottles you charged Rs.760. I dont know what kind of business you are making. It wasn't what I had anticipated and expected. People were unaware of my booking, you need to accomplish a lot more in context to coordinating these things. Your kind exchanging my meal from breakfast to dinner help me a lot on my trip. This lovely service will give me next chance to stay at your hotel again ! Hope to receive best service in future with many thanks. Restrunt's meal is very delicious. Hotel all mans(lady's and gentleman) is very good and kindness. Mr.SIVA is good. SIVA is room cleaner. If I'm given the chance to travel back in India, I'm still choosing Novotel the place to stay due to its delicious foods and delicacies, the friendly atmosphere, variety of amenities and excellent service. Definitely my money's worth. The Hotel staff is very friendly and very accommodating to the needs of their clients. Foods and drinks taste great, relaxing atmosphere, excellent service and definitely worth the money. The leadership and staff were equally kind, understanding and helpful. Service needs serious improvement as laundry and housekeeping is never consistent. Especially housekeeping. Even if we take the trouble to ask for it daily (my stay was for almost a month), at least once or twice a week they'll miss the instruction. The food buffet menu needs to improve as to have more variety on a daily basis. For guests who are having a long stay it's not appetising to eat almost the same menu daily. All of the staff at the Chennai Sipcott are freindly, courteuos, well dressed and egger to please. all of the meals that i have had there over the last two weeks have been second to none. I cannot recommend this hotel and resturant highly enough. Good work team. The manager Mr. Suresh is serving us very well, the food is awesome. All the staffs are very helpful such as Bharat, Ghani, Nathini and Surej. They all will suggest the special and delicious dish to us. We have a very fantastic experience in Novotel. The room services also very good especially Bobpi, she will give surprise every time after housekeeping services.